flour along with the sultanas. 2 Gradually mix in the milk to form a soft dough then knead gently on a floured surface. Roll out to an 18cm circle. Brush with a little milk and sprinkle over the gently pressing into reserved mixed peel, the surface. 3 Cut the dough into 8 wedges and place on a greased baking tray. Bake for 8-10 minutes until golden. Place on a wire rack to cool. 4. Meanwhile, whisk the cream until firm, then gradually stir in the zest and juice of the easy peeler. 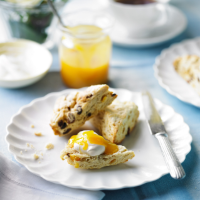 Serve the scones with the scented cream and orange curd. The scones can be made and frozen in advance, just defrost and warm in the oven for 5 mintues before serving.